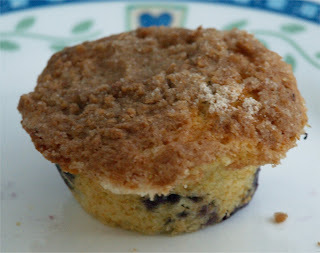 There is nothing quite like a blueberry muffin in the morning. Not to mention they go so well with a hot cup of your favorite coffee or tea and always with a cool glass of milk. This is a very simple recipe that you will really enjoy. Pre-heat oven to 400 degrees and grease muffin tin. Place vegetable oil in a 1 cup measuring cup; add the egg and enough milk to fill the cup (approx. 1/3 cup). Gently beat ingredients together. Fill muffin cups to the top and sprinkle with crumb topping. Bake 20-25 minutes. Let cool and enjoy! * Hint: Place your blueberries in about 2 tbsp. of flour and gently roll them around until the berries are lightly coated. This will help them from sinking to the bottom of your muffin. Mix all ingredients with a fork (will resemble crumbs) and sprinkle over muffins. Thank you for your kind comments. :) Hope you enjoy your time here.